When The Machine That Changed the World was first published in 1990, Toyota was half the size of General Motors. Today Toyota is passing GM as the world’s largest auto maker and is the most consistently successful global enterprise of the past fifty years. This management classic was the first book to reveal Toyota’s lean production system that is the basis for its enduring success. Now reissued with a new Foreword and Afterword, Machine contrasts two fundamentally different business systems—lean versus mass, two very different ways of thinking about how humans work together to create value. Based on the largest and most thorough study ever undertaken of any industry—MIT’s five-year, fourteen-country International Motor Vehicle Program—this book describes the entire managerial system of lean production. Nearly twenty years ago, Womack, Jones, and Roos provided a comprehensive description of the entire lean system. They exhaustively documented its advantages over the mass production model pioneered by General Motors and predicted that lean production would eventually triumph. Indeed, they argued that it would triumph not just in manufacturing but in every value-creating activity from health care to retail to distribution. 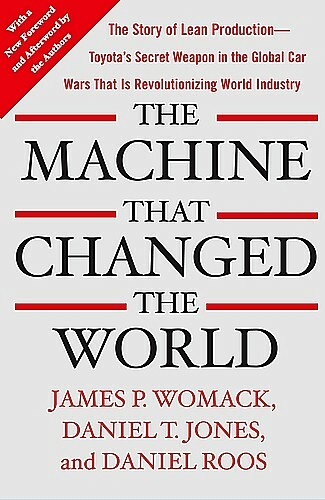 Today The Machine That Changed the World provides enduring and essential guidance to managers and leaders in every industry seeking to transform traditional enterprises into exemplars of lean success.